Hardcover, 7 x 9.25 in. / 58 pgs / 30 color. 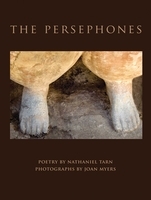 In The Persephones, American poet Nathaniel Tarn (born 1928) and American photographer Joan Myers (born 1941) offer an elegant, collaborative retelling of Persephone’s abduction into the underworld. Many of Myers’ images were shot at the sites from which the myth originated. Edition of 500 copies. Text by Joan Myers, Kathleen Stewart Howe. FORMAT: Hbk, 7 x 9.25 in. / 58 pgs / 30 color.